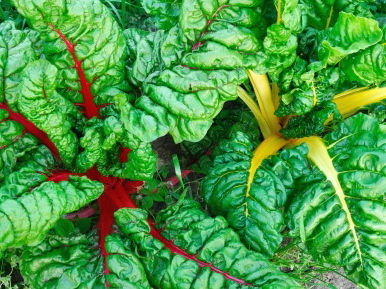 The pickup: In season from early October into early April, chard is arguably the most eye-catching winter vegetable; with its rich green leaves and stems the color of pomegranate seeds, each bunch appears inspired by holiday color schemes. On appearance alone, I’d fallen under chard’s spell. But I didn't know how to prepare it, with its occasionally thick leaves and tough stems. The results: The easiest way to prepare chard is to strip the leaves from the stems and make a quick stir-fry out of it, cooking the stems first and then wilting the leaves. Dressed with a bit of vinegar or a squeeze of lemon, it's a great winter side dish. But chard also works well as pretty packaging for wild, brown, and red rice — sort of like a leafy burrito. I decided to loosely follow a recipe from Whole Foods but substituted ingredients to cater to my pantry provisions (feta cheese for the goat cheese, dried cranberries for the raisins). When I was ready to cook, I pulled the chard out of the fridge (I'd stored it inside a plastic bag, wrapped in a damp paper towel) and quickly blanched the whole leaves in a large pot of boiling water. This step made the leaves more flexible; after lightly pressing them dry, I wrapped them around spoonfuls of filling. A quick trip to the oven, and my stuffed chard leaves were a warm winter lunch.